A macular hole is a small break in the macula, located in the center of the retina (the light-sensitive tissue in the back of the eye). Patients with a macular hole usually complain of a round blind spot in the center of their vision. This blind spot can increase in size without timely surgical management. If you have a macular hole in one eye, there is about 5-10% chance that your other eye develop a macular hole. 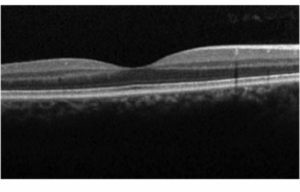 As a normal aging change, the vitreous gel sometimes separates from the back of the eye (posterior vitreous detachment, or PVD). In some cases, the vitreous gel is “too sticky” and is tightly attached to the retina. This increases the chance of a macular hole formation during a PVD. Another cause of macular holes is eye trauma, which can occur at any age. Until recently, it was thought that nothing could be done to prevent or reverse this condition. In the early 1990s, retina specialists found that removing the vitreous gel from the inside of the eye seems to help close the macular hole. 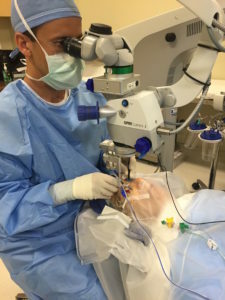 The surgery involves placing instruments inside the eye through small incisions in a technique called “vitrectomy.” The vitreous gel is removed from the eye. The second part of the surgery involves peeling a very thin layer around the edges of the macular hole (internal limiting membrane peeling). The last part of the surgery involves placing a gas bubble in the eye (SF6 or C3F8). After surgery, the patient maintains a face-down position with the eye looking at the floor. This will make the bubble float up into the back of the eye, and this is important in keeping the hole closed. While having a gas bubble in the eye, the patient should not go to high altitudes such as flying in an airplane. Without surgery, most macular holes tend to increase in size, worsening the central blind spot. At Newport Retina, we are proud to have a 100% closure rate of macular holes. Please call us if you have any questions about macular holes or if you like to schedule a consultation.